Artist's concept of Rocketplane-Kistler's K-1 Orbital Vehicle. WASHINGTON – NASA said Oct. 18 it had pulledthe plug on its agreement with Rocketplane Kistler (RpK) to help finance thecompany's effort to develop a commercial transportation service to and from theinternational space station. NASA willtake the $175 million previously committed to RpK under the Commercial OrbitalTransportation Services (COTS) program and put it back out for competition in amatter of days. "Wespent the last year trying to work with RpK to give them every opportunity tosucceed," said Alan Lindenmoyer, who oversees COTS as manager of theCommercial Crew and Cargo Program Office at NASA's Johnson Space Center in Houston. "Based on its failure to meet its performancemilestones, we've come to the conclusion that it is in NASA's best interest todiscontinue our funded Space Act Agreement and reopen the competition for theremaining $175 million." In a pressconference at NASA headquarters here, Lindenmoyer said the agency plans torelease a solicitation for a new full and open COTS competition Oct. 22.Companies interested in winning some or all of the money now available toinvest in new COTS concepts will then have 30 days to submit proposals. 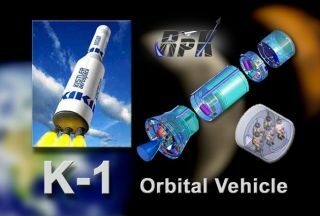 RpK ofOklahoma City was one of two companies picked by NASA in mid-2006 to share some$500 million in public funding to help them build and demonstrate competingvehicles capable of carrying cargo and potentially crews to the internationalspace station. The other COTS winner was Space Exploration Technologies Corp.of El Segundo, Calif.
RpKstruggled from the beginning to raise the $500 million in private capital itneeded to complete its fully reusable K-1 rocket – in development for more thana decade – and launch it to the station. But it was not until well after RpKfailed to meet a renegotiated May deadline for completing its financing andalso missed a key early technical milestone that NASA moved toward terminatingits agreement. On Sept. 7,NASA sent RpK formal written notice that the company was in breach of itsCOTS agreement for failure to meet the May financing deadline and for notcompleting a promised critical design review of the K-1's pressurized cargomodule on schedule. That notification set the clock ticking on the 30-dayperiod NASA was required to give RpK before terminating the agreement. Lindenmoyersaid NASA's associate administrator for exploration systems, Richard Gilbrech,called RpK the afternoon of Oct. 18 to tell them that time had run out. Lindenmoyersaid RpK was told it could continue to work with NASA on the K-1 through anunfunded COTS agreement similar to ones the agency has awarded to a half-dozencompanies interested in selling resupply services to the international spacestation after the space shuttle retires in 2010. Lindenmoyersaid that RpK also is free to submit a new proposal when the new COTSsolicitation is released. NASA hopesto evaluate proposals and make its new selection or selections during the firstquarter of 2008, Lindemoyer said.